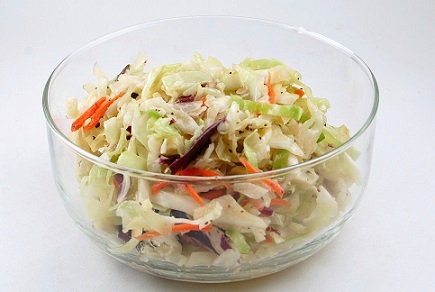 This Cole Slaw Recipe is delicious and is a great way to add raw cabbage to your diet (fiber). It's nutritious! 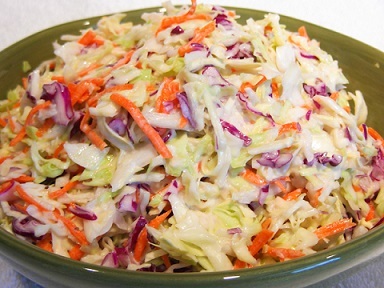 This restaurant recipe for Cole slaw is very popular with restaurant customers (and my home guests, as well), especially during the spring and summer months. It is now a favorite restaurant recipe. Only the traditional potato salad is as popular. Preparation time: 15 minutes. Serves 4. Enjoy! Note: You can use 1 package of prepared cole slaw mix from the grocery store if available. Such a mixture usually has all the above ingredients. This dressing will last 2 weeks in the refrigerator if you wish to make a larger amount. 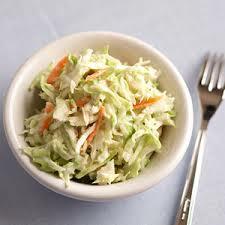 Note: I recommend you add the dressing to your cole slaw mix just before serving to avoid the slaw becoming soggy. Also the poppy seeds if using. Cookout Menu. Check it out. Did you know? 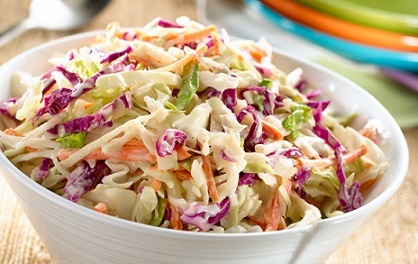 Cole slaw probably became popular in America when a deli owner (Richard Hellmann) in New York City created a formula for bottled mayonnaise in 1912. It was a quick and easy dressing for shredded cabbage.